J Rodríguez Terceño, JE Gonzálvez Vallés, D Caldevilla Domínguez (2017): “Application of a measurement model and system of intangible variables in business environments”. Revista Latina de Comunicación Social, 72, pp. 560 to 573. Currently there are many formats of networks, associations, clubs, clusters and groups for all types of businesses. Most, if not all, businesses base their relationship on the potential interest, and as a result the bond is cyclical and unstable. This research examines the recognition/emotion paradigm raised by companies in their stakeholders. The study is based on the hypothesis that the commercial success or failure of a company is predictable as depends on the achievements or failures of the behaviours stated by the company (values, principles, policies, etc. ), which generate emotions and are recognised by their stakeholders (customers, suppliers, employees, investors) through the so-called digital sources. The study measures, both qualitative and quantitatively, the feelings, emotions and sensations expressed by stakeholders towards the products and services on offer. The results of the application of the foresight tool suggest that there is a direct relationship between the perceptions/emotions of the public and the commercial success of companies, which are the subject of these perceptions/emotions. Keywords: Foresight; intangible variables; impact; emotion; business. Contents: 1. Introduction. 2. Methods. 2.1. Objective and hypothesis. 3. Results. 3.1. Foresight, scenarios and measurement of intangibles. 3.2. Experience, emotion and business. 4. Conclusions. References. Today’s world, which is ruled by the so-called ‘digital culture’, is characterised by the production of huge amounts of information, as well as disinformation (noise), in some sectors and parameters, reaching the levels of big data. This situation requires social, cultural and, above all, technological advancements that enable the construction of novel approaches to think (new ways of thinking) and, therefore, act (new approaches in decision-making), especially from the perspective of communications and public relations, which are closely linked with the business world. These enormous amounts of information and data, both structured and unstructured (including intermediate levels of imbalance, or semi-structured sets of data), entail an equivalent enormous cost, not so much in monetary terms, although the possibilities to monetise such information and data are always present (although the long-term economic benefit does not always translate into money in the short term). Instead, the enormous cost is in terms of time, and time, in our modern digital world, costs lots of money. In addition to the volume of information, another added difficulty is the variety of data as a result of the digital sources in which data sets can and are located. An example of this is the entries that can be collected from social networks in many different formats: text, audio, video, still images, etc. When the volume of data is so large and requires the quickest possible response, conventional databases complement big-data platforms, whose speed of analysis is much greater, because they are designed to be executed in large-scale distribution systems, i.e., to work with large volumes of information and data, regardless of whether they are structured or not. The business world, according to the perspective of communications and public relations, as mentioned, requires managing such large amounts of information (few times close to the volume of the big data), or at least to obtain the proper tools for big data management, analysis and classification, in such areas as business management, social responsibility and ethical behaviour, marketing of services, brands and products, internal communication, etc. “In that sense, the management of knowledge in these participatory environments helps generating value for the organisation’s stakeholders” (Oliva, 2013: 71). In other words, it is necessary to have control level that allows the subsequent management of that information in all matters concerning the company, in all its spheres and areas, to be able to determine or quantify the impact of all the actions and communications of the company on its stakeholders, to define how their experiences and emotions interfere and affect the results of the organisation, and to determine its future influence on trends and decision-making processes. However, these experiences and emotions are, most of the times, intangible factors that need to be measured and quantified in order to materialise their influence and plan future lines of work and avoid unnecessary risks, or at least anticipate them to reduce them, by having a general, yet categorised and detailed, picture of the company, its business, actions and communications. Thus, “the management of intangible variables to contribute to the differentiation of the company with respect to its competitors as well as to respond to the demands of the different stakeholders” becomes necessary. This way, “small businesses and large multinational groups and SMEs acquire a commitment to maintain a self-demanding corporate behaviour with their existing and potential internal and external publics” (Terceño, Caldevilla and Ramos, 2015: 25). Based on the relationship between intangible variables, such as the experience and emotion of the user-consumer and the business, the development and future of the company demand appropriate tools to become tangible, i.e. to quantify these intangible factors and give them a qualitative assessment, and analyse how they affect the results of the company and its business, by being able to anticipate the trends and lines of action of stakeholders, taking as point of departure the experience and emotion already generated in them, setting the company’s lines of action and communication for the short, medium and long terms, which are scenarios in which foresight and forecasting tools come into play, particularly when there is a large margin of time. The objective of this study is to analyse the type of relationship –direct or indirect– that exists between intangible factors or variables and the objectives and results of the corporate or institutional businesses and very diverse organisations, as well as their effects. However, to minimise the subjective part in the analysis and the results, we will focus on economic-monetary business objectives and goals, as for example the stock share price of a company, a business group or a consortium, insofar as it is a tangible indicator of real value. Today, intangible factors or variables represent at least one-third of the real value of a company or organisation so their management must be active and must be channelled beyond the short term, even beyond the med-term. Thus, foresight tools have become necessary to manage and anticipate possible and probable scenarios and help in the study analysis and classification, quantification and qualification, of intangibles, to produce a concrete numerical value that will help us consider and categorise these intangible factors and variables, to reduce uncertainty and risk in decision-making within a Strategic Foresight Plan designed to run in the long term to reach specific targets of business benefits and profitability. The existence of the relationship between the business results and intangible variables forces companies and institutions to improve profitability in all dimensions and areas, because the (current and non-current) assets that have traditionally been considered to calculate the real value of a company have given way to intangible factors that have evolved from a simple perception of value and loyalty of users-consumers to an integral element beyond the mere decision to purchase a product or service: they have become a guarantee for the effective and efficient relationship with stakeholders. Intangible factors such as feelings, experiences, emotions and attitudes can be grouped together with the generic yet correct term Emotion or Emotions (which will be defined later). These emotions are based on the trust that has been generated in the user-consumer but has expanded to the internal structure of the company, incorporating workers (internal communication and dramanagement), suppliers and other publics. Companies need to generate positive experiences or entries in the emotional account of the client, because Emotion has become a factor with strategic range within the business plans. Emotion is a key factor given that ‘emotional identification’ is key to connect with stakeholders, with users and end clients because the results and future plans (economic objectives and benefits) depend on their feelings, perceptions, emotions and opinions towards the company or organisation. The connection with the public and clients, in other words, the emotional communication goes far beyond the simple opening of digital communication channels, be they social networks, forums, blogs, web pages, etc. It is necessary to establish an effective interrelation that enables, from the margins of the company or organisation, measuring, controlling and managing those feelings and emotions expressed or communicated through these channels. Before formulating the central hypothesis of our study, we need to define the Emotion variable as a set of intangible factors within the business and institutional environment and part of the current scenario, and to understand that its measurement and analysis, as a foresight tool, will allow the forecast of possible future scenarios that are favourable to the business interests and keep risk and uncertainty to a minimum. In this study, Emotion includes the Experience of the public, user and consumer, i.e. the experiential relationship with the company or organisation as a result of the management of the latter. We can categorise Emotion into six major areas, which can be divided into subsections that will facilitate classification and analysis: 1) Products, Services and their Marketing; 2) Work biosphere; 3) Corporate Ethics; 4) Social Responsibility; 5) Corporate Senior Management; and 6) Solvency and Profitability. By Management of the company or institution we understand what the latter does and says, getting a response or feedback from its stakeholder. Feelings and Emotions are the states of mind, moods, of the stakeholders resulting from their experience with the management of the company and the environment (of both and one), i.e., their reactions to their experiences. The manifestation of this mood and willingness constitutes the Attitude, predisposition, beliefs, intention of conduct towards a company, institution or organisation, its services, products and brands, most of the times acquired through experiences and emotions, of their own or of others, and that dictate specific behaviours with a specific impact. When the attitude is not of their own, influencers come into play: social “influencers”, i.e., influences and recommendations when they are considered generators of opinion trends, and financial influencers when the information provided has direct impact on the economic variables of the business. Therefore, we define emotion as the state or states of mind or moods generated as a reaction or consequence of the experience of the public, user-consumer, with the company or institution, affected by influences and recommendations, that is, beliefs, intentions, or behavioural predispositions, which can be of their own or of others and that determine an attitude and, in short, affect the business, objectives and management of the company or organisation. The second variable that we will include in the hypothesis is the Business or Objective/s of the company or institution, i.e., the value resulting from the business management and from the relationship of the company with stakeholders and from the feedback from the latter to the former. This value represents a tangible indicator that can be objectively observed, which for this study is the share price (at the close of the market) of the companies included in the sample. The Emotion and Business of a company or organisation are directly related: if the emotion is positive, then business (economic performance) increases and if the Emotion is negative, then the Business decreases. We developed our hypothesis in the following way: The Emotion, defined as factor or intangible value, and the Business of a company or organisation, understood as the price share (tangible indicator), are directly correlated in the sense that, if the emotion is positive, i.e. if the mood is positive as a result of the experience of stakeholders, expressed through opinions and comments on different digital sources, then the economic result of the company, its Business, that is, its stock exchange rate (at the end of the day) increases positively. Conversely, if the Emotion is negative, i.e., if the mood is negative as a reaction to the experiences of the user-consumer with the company and its environment, expressed in the opinions collected in digital sources, then the business is negative, i.e., the stock share price. 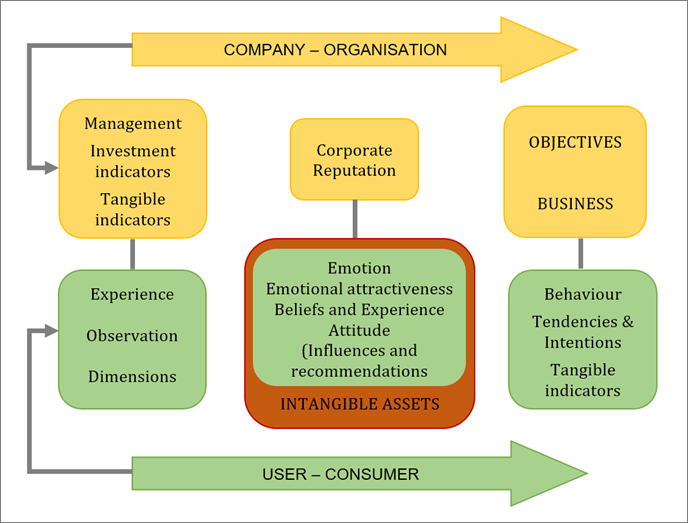 The method used in this analysis is supported by a model and system design to measure the emotional impact (of intangible variables) in five stages: Management, Experience, Emotion, Attitudes and Business. This model has been developed by the Chair in Intangible Metrics and Management, directed by Professor José Ignacio Peláez of the University of Málaga (Peláez, 2016). The method used to measure intangible variables or factors is based on a dynamic analysis (Collection and Selection of Information, Analysis and Quantification of Information, Results, Impact and Influence), of continuous measurement. Obviously, for our study we selected a period of time, which includes the collection of entries from digital sources (stock market quotation platforms, online media, web pages, discussion forums, social platforms and networks such as Facebook and Twitter, and video channels such as YouTube and Vimeo, etc.) and all the information that reflects emotions relating to the experience of the stakeholders of the company, organisation or institution and its environment, as well as the (tangible) indicator of the stock share price. The information entries refer to the small group of bank companies belonging to the Corporate Excellence - Centre for Reputation: BBVA, Bando de Sabadell, Banco Popular, Santander Bank, Bankia, Bankinter, Caixabank. 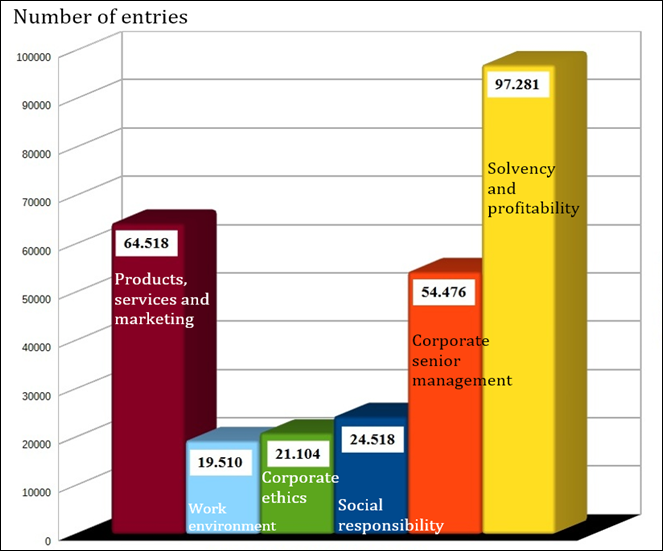 The entries were collected during the first half of 2015 (from 1 January to 30 June). 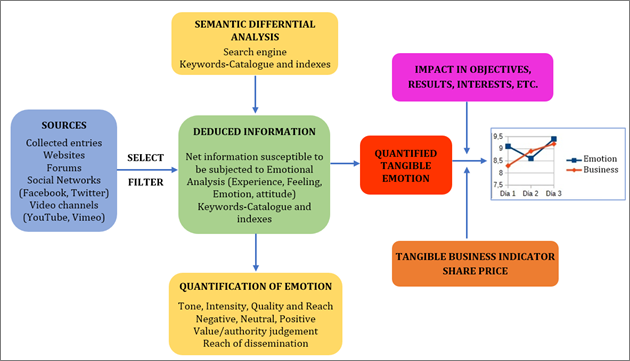 The information collected from these public digital sources was filtered to select only those that, based on their content and contextual assessment, are susceptible to an analysis of feelings and emotions, as mentioned, and may affect the business, results, objectives and management of the aforementioned companies. This measurement model puts into relation intangible variables with tangible variables, although during the process we turned the former variables into quantifiable elements to weight the value of the relationships of the companies with their stakeholders and their impact and influence. In other words, it is a model that allows us to establish a relationship of cause and effect based on emotion. From a positivist viewpoint, the heuristic methodology, as a method of differentiation, “establishes the scientific nature based on the analysis of actual facts about the subject and society; social phenomena involve an inexhaustible source of epistemic and methodological positions” (Gamboa, 2014: 30). To analyse and quantify emotion we take phraseological units, i.e. the expressions of those emotions, and give them a value according to three features: Tone or Polarity (negative, neutral, positive), Intensity (gradation of tone, very negative, negative, neutral, positive, very positive) and Quality (in the sense of value or authority judgement, who expresses or transmits that Emotion? and what is its reach and dissemination?). Some expressed emotions may not be worthy based on the sender, but may be worthy based on their reach, when for whatever reasons they, for example, go viral and reach mass dissemination. This evaluation is expressed on a numerical scale with the following range: Very Negative (Hate, with a value less than or equal to 2); Negative (Rejection, greater than 2 and less than 4); Neutral (Indifference, equal to or greater than 4 and less than 6); Positive (Acceptance, equal to or greater than 6 and less than 8); and Very Positive (Admiration, equal to or greater than 8). Finally, after the (net and useful) Emotion has been quantified and weighted, the last phase of the methodological model involves determining the relationships, impact and involvement, existing between Emotion and Business, the result of the stock exchange rate. Finally, once quantified and weighted emotion (NET and useful), the last phase of the methodological model involves determining relationships, impact and involvement, existing between the emotion and the business, the result of the stock exchange rate. A Cartesian coordinate graph is used to project the trajectory and trends of both variables in the selected time period, specifying the relationship and impact (if any). Based on the aforementioned measurement system developed by the Complutense University of Madrid and the University of Málaga, we graphically represent the Emotional Impact Measurement Model to get a wide and clarifying overall view. Thanks to the model we can collect information entries from the various public or semi-public sources, of those with greater value, a value that we weight according to dissemination (reach) and the value judgment (the importance of the sender of the message), selecting certain sources and discarding others according to the interests of our study (economic and financial sources, textual and hyper-textual sources, mass media, social networks, websites, etc.). Information is filtered to obtain that objectively useful information that will be submitted to the semantic differential analysis, i.e., the quantification of emotion according to the aforementioned characteristics and variables to obtain resulting deductions within a numeric scale that will be put in relation to the selected tangible business indicator, which in our case is the share price, to determine the involvement or impact on the results, to be able to define trends and interests by following past scenarios, i.e., to predict future scenarios to signal routes, according to objectives, of the subsequent decision-making to improve or maintain the results. The partitioning possibilities of the model even allow customisation depending on the organisational niche under study: specific selection of sources; application of specific tools in the analysis (search engines, catalogues or indexes, for example); categorisation of the experience of final customers and stakeholders; response to the recommendations of “influencers” (both social and financial); impact in stock profits, at the level of sales, corporate image, social responsibility, etc. The following section outlines the theoretical framework in which we place our study and analysis, linking foresight and its tools with the measurement of intangibles, given that the current situation makes them, as mentioned, essential. Foresight, for the purposes of our study, is the process or series of techniques and methods, analysis and systematised studies that are carried out on a subject with the intention of exploring it as a whole and to predict future possibilities. In other words, foresight is the study and analysis of the technical and technological, scientific, economic, social and political causes that enable great advances in the evolution of the contemporary modern world to be able to provide plausible scenarios based on the interconnection of these and other materials. The techniques, analyses and studies that are part of the foresight tools, are collective exercise of analysis and communication, most often between experts, considering that there are, and are used, multiple methods, systems, therefore they are equipped with continuity and a scientific methodological order to identify those components that determine likely future scenarios as well as their influences, forces, trends and technological, economic and social obstacles (its character is clearly multidisciplinary). Foresight includes, or to be more precise absorbs and improves, forecasting and planning techniques, strategies and tactics that go a step beyond the existing models of strategic management and planning, and come ahead of time (insofar as they evolve) of the conditions that allow structures and organisations of all kinds to adapt to the circumstances of the time and their objectives, considering the strategic value of the environment and the context (which is always multidisciplinary), identifying key future variables, methods and scenarios, through the systematisation of collective reflection in order to build, or at least enable, new scenarios that minimise risk and uncertainty. All this while taking into account, in the sense of quantifying and qualifying, the experience, feelings, emotions and attitudes of the user-consumer, and all the stakeholders, to determine how they affect the results, goals and business (corporate, private, but also applicable to public administration, for example) and to turn them into tangibles in the present to analyse and study the trends and behaviours that enable a future scenario with lower risks and uncertainty in the decision-making relating to the actions and communications of the company or organisation. If one of our objectives (necessary and complementary, when it comes to using foresight tools, or methods and models close to it, with the intention of planning our actions and decision-making in the mid and long terms, by reducing uncertainty and risk) is to know and locate (relocate and lay down) of our company or organisation in its environment (Integrated Approach to Strategic Foresight), it is necessary to know all the specifics of our group, all of its competences, to formulate strategic actions that are oriented according to the scenarios of the general and competitive environment. It is necessary, therefore, to reconstruct or represent the current state, the present stage of our institution or company and its environment, which will allow us to categorise all those factors or actors that we consider most important and influential in the evolution of our organisation and its trends, from which we can identify and analyse all kinds of key variables and be able to formulate hypotheses and possible future lines of action that aim to reduce risk and uncertainty, improve or end a trend, improve our competence and position and, ultimately, achieve our goals. Many times, defining the situation and environment of our company or organisation, includes measuring some intangible factors, all the information produced by the digital culture, because these intangible assets expressed in digital environments and media influence and have an impact on the business variables, the objectives of our institution or company. The Emotion and Experience of the user-consumer is the result of the relationship that they establish with the company or organisation, which can be classified, based on the opinions, beliefs, attitudes, recommendations they share in digital media-sources, in such categories as: brand, product, service, and marketing (functionality or practicality of the product, access to the service, commercial transaction, innovation, communication and commercial feedback, after-purchase options, etc); work ecosystem (internal communication, commitment and job opportunities, professionalism, ethical practice, work environment, etc. ); social responsibility, corporate reputation and ethical behaviour (social and environmental awareness, solidarity, corporate integrity and transparency, true communication); management and decision-making areas (management and resolution of conflicts and problems, diplomacy, management perception, high skills and professionalism, vision and institutional and entrepreneurial projection); and solvency, profitability and security (growth and expansion). The Emotion, which has been already defined, is understood as the state of mind of stakeholders, towards the organisation and the environment in which they both operate. The emotion can be primary or innate and secondary or learned. The initial aim is to determine the “tendencialisation” in a period of time that allows us to know the stakeholders perceive a company or organisation, their actions and communications, their impact on the experience of the users-consumers (end-customers, but also other stakeholders if our perspective fits into the area of internal communications -employees, suppliers, etc. ), and the impact of users-consumers on the company, translated in opinions and emotions. This allows us to obtain a complete picture of the environment of the institution, and the influence and impact of the experiences and emotions on the objectives and business. Therefore, it is feasible to influence those experiences and emotions to change the trend and influence the decisions of these audiences in favour of the objectives pursued, reducing uncertainty, given that we would already know the ideal scenario we hope to achieve based on present and past scenarios from which intangible factors have been quantified to draw the line of evolution of the interrelation between the organisation and user-consumers (either positive or negative), and to reduce the risk in decision making, which should follow a Strategic Foresight Plan. In other words, we use the measurement of intangible factors as a foresight tool to predict, and influence in its creation, plausible future scenarios that are favourable to the objectives and interests of our organisation, company or institution. The measurement of these intangible factors, agents or actors, through their classification, assessment and quantification, provides data about the real impact they have on the company, for example, in terms of sales, stock market trading prices, corporate image, social responsibility, etc. With a general but also sectorial, categorised and sub-categorised image we can isolate positive points or peaks, i.e., those where certain experiences and emotions affected and influenced positively on the objectives and interests of the company to modify a negative trend (which would lead inevitably to a negative scenario) and channel the information towards positive experiences and emotions. After quantifying emotion, it was correlated with the selected tangible indicator, the share price, to check the impact and influence of the former on the latter, as well as the direct or indirect relationship between them, which we have accepted a priori, i.e., to test our hypothesis (which says that there is a direct relationship exists, that if emotion was positive, en the share price would increase and that if emotion was negative then the share price would decrease. Figure 3. Inferred net information by categories. Source: Authors’ own creation based on the First Report on Intangible Assets in Digital Ecosystems (Peláez, 2016). In the first place, we will pay attention to the figure that correlates attitude and business, the share price, based on the data extracted from the First Report on Intangible Assets in Digital Ecosystems developed by the University of Málaga (2016), which considers, for the analysis of Emotion, those attitudes relating the financial influencers, distinguishing between investment recommendations (positive Experience-Emotion) and negative recommendations (negative Experience-Emotion). 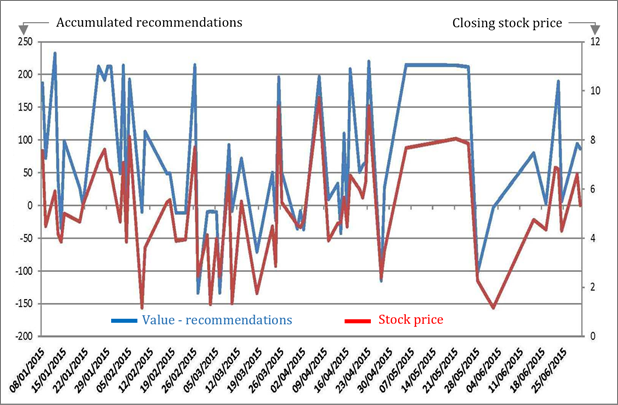 The previous figure shows the direct relationship between Attitude, among the recommendations, whether positive or negative and the closing share price. Thus, we observe that when the value of the Attitude, of the recommendation, is negative, as in 12 February, 30 April, 28 May 28, to cite three peaks of significant negative decrease, the closing share price experienced a similar negative drop. Conversely, when the recommendation, the attitude, is positive, the share price increases proportionally, most of the time. This happened on 26 February, 26 March, 9 April and 23 April, to cite significant peaks in the six-month period under study. Obviously, there are also peaks where, although the correlation is direct, the impact is lower. For example, on 25 June the increase in the consideration or the significance of the Attitude is greater than the increase in the closing share price. Similarly, there are points in the trend where the direct relation is not observed, as in the case of the increase that occurred on 4 June in the quantified value of Attitude, which is reciprocated with an even higher increase in the share price, the value of the Business. All the information obtained from the interpretation and reading of the graph was submitted to a process of minimisation of residual information and a compensation of irregularities and exceptions, in other words, a peak-valley compensation. We can confirm the direct trend and correlation between attitude and share price (when the attitude or recommendation is positive, this has a positive direct impact on business, ergo, there is an increase in the closing share price). Now it is time to analyse the relationship between Emotion, as a unifying concept for the variables defined at the beginning of our work. 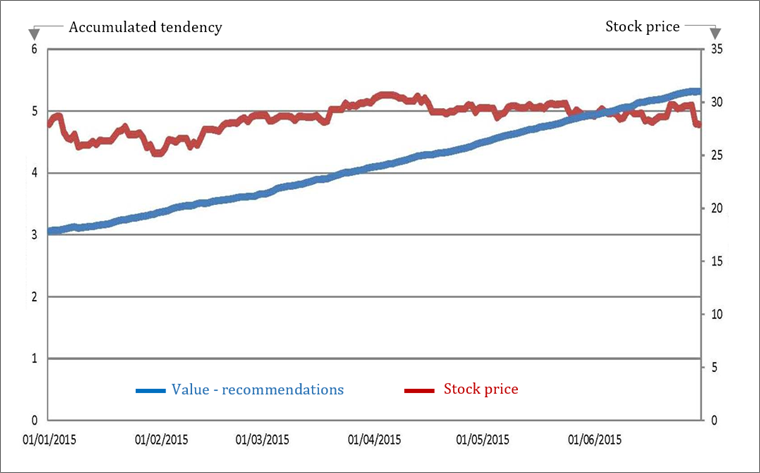 Once again, the daily values for both the Stock Share Price and the Emotion are subject to compensation with the objective of simplifying the trend lines during the interval of time (first half of 2015). In other words, we minimised the residual information to obtain the significance of the direct relationship, which is more important for the objectives of this study than the daily variations that become observable after quantifying Emotion. In this way, the observable preference in the ascending Emotion is not reciprocated with a rising positive share price, at least in the global line of the time period under analysis and in a proportional way. Figure 5. Emotion and business (share price). This means that, when valued in isolation, the Emotion and Share Price indicators may correspond in some points (daily data) and may not correspond in others, but the general trend, the relationship between Emotion and Business is direct, despite the lack of proportion, because during the last month we can see that a rise in the value of Emotion coincides with a small decline in the share price, the trend coincides and remains. Another interpretation is that the tendency and evolution of emotion is upward, going from a positive value to one more positive and that the trend, in absolute terms, of the share price is also upwards because in that period of time, although the final outcome with respect to the initial value is lower (it has fallen, as a whole), the trend is positive (ascending), without the descending negative value of the last days of the sample affects, significantly, the total trajectory. Taking these variations into account, and compensating for irregularities in the trajectory, we can determine that there is a direct relationship of influence between Emotion and Business, between Emotion and Share Price, i.e., when Emotion is positive, there is a positive response in the Share Price (increase), although the impact is not, if you will, crucially significant in the whole (the more significant and similar variations on both lines would have been clearer in this meaning), but the trend, as we say, coincides and holds. Therefore, and by way of conclusion, based on the results we can corroborate the hypothesis raised initially. There is a direct relationship of involvement and influence and, in general terms, which is necessary to forecast possible scenarios and future lines of action. The results are, therefore, sufficiently significant to reduce, significantly, risk and uncertainty in the actions and decision-making of the company or organisation, provided these trends are considered in the long term and the analysis is not reduced to a single semester, which is required by strategic foresight plans. Moreover, we can make some adjustments to the measurement model and the method used, such as including improvements in the quantification model, adding more concepts and keywords to sieve we used to filter the collected information when applying the semantic differential analysis, or to specify more, whenever possible, the valuation of the Emotion, to obtain more numerical data to weight. We could also filter and select, going a step beyond, the inferred or net information and subject to the analysis only those Experiences and Emotions relating, in our case, to stack market information and prices. Therefore, to conclude we want to highlight the usefulness of models for the measurement of intangible variables, like the one exposed here. These models are a very important part in the real valuation of a company or organisation, which requires the management of the emotions, feelings, attitudes, beliefs, intentions and opinions of stakeholders, be they employees, suppliers, or customers. This Emotion, which is characterised by uncertainty, according to the business or organisational perspective, is one of the most capital factors within strategic foresight business plans, which aim to provide plausible scenarios where risk, in terms of actions and decision making, is reduced as much as possible. Therefore, the use of tools to measure intangible assets is essential, particularly because these tools allow us to determine (quantify and qualify) when and how Emotion affects the results of the Business. Andreu, J.M. (1990): Banca universal versus banca especializada: un análisis prospectivo. Instituto de Estudios de Prospectiva. Madrid. Bas, Enric (2002): Prospectiva: cómo usar el pensamiento sobre el futuro. Ariel. Barcelona. Bas, Enric (1999): Prospectiva: herramientas para la gestión estratégica del cambio. Ariel. Barcelona. Bueno, E. (1993): Fundamentos de economía y organización industrial. McGraw Hill. Madrid. Caldevilla, D. (2009): Relaciones públicas: iberismo y prospectiva. Vivat Academia; 107: 1-49. Castaño, C., Arranz, F., León, Omar. (1990): Tecnología y empleo en el sector financiero español. Instituto de Estudios de Prospectiva. Madrid. Castells, M. (1990): El impacto de las nuevas tecnologías en la economía internacional: implicaciones en la economía española. Institutos de Estudio de prospectiva. Madrid. Gamboa, A. (2014): La estrategia heurística: variante del pensamiento científico para la investigación socio-cultural. Revista de Comunicación de la SEECI; Extraordinario: 26-34. Georghiou, L. (2010): Manual de prospectiva tecnológica: conceptos y práctica. Flacso. México. Godet, M. (2011): La prospectiva estratégica: para las empresas y los territorios. Dunod. París. Godet, M. (2007): Prospectiva estratégica: problemas y métodos. LIPSOR. San Sebastián. Martín, R. (2004): Globalización y visiones prospectivas. Generalitat Valenciana. Valencia. Máttar, J., Perrotti, D. (2014): Planificación, prospectiva y gestión pública: reflexiones para la agenda de desarrollo. CEPAL. Santiago de Chile. Mazo, ME. Variables psicológicas que impulsan la difusión del rumor. Revista de Comunicación de la SEECI 2016; 40: 104-121. Oliva, C., De la Quintana A. (2013): Ética empresarial, interactividad y conexión emotional: paradigmas de la cultura corporativa de las empresas en la web 2.0. Vivat Academia; 125: 68-85. Peláez J. L. (2016): I Informe de activos intangibles en ecosistemas digitales (INTED). Universidad de Málaga. Málaga. Rodríguez-Terceño, J., Caldevilla, D., Ramos, F. (2015): «Dramanagement»: cine, empresa y responsabilidad social corporativa. Revista Opción; Especial 1: 23-40. VV.AA. (2006): Prospectiva de las sinergias entre empresas españolas y americanas en torno al I+D+I. EOI. Madrid. VV.AA. (2005): Prospectiva y construcción de escenarios. MDP. Santiago de Chile. VV.AA. (1999): Prospectiva sobre tendencias futuras de demanda profesional en España: perfiles profesionales y empleo derivado. EOI. Madrid. Article received on 18 on December 2016. Accepted on 29 May. Published on 2 June 2017.